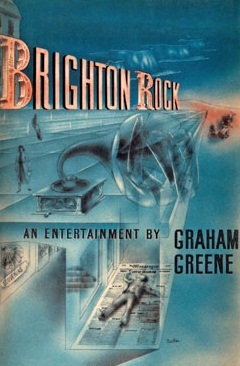 Graham Greene’s Brighton Rock is an exceptionally well written thriller and study of human nature, and it is because of this that it is an essential read. This is reflected by its title which is a reference to the popular seaside confectionary, and it is used as a metaphor for human nature: the individual’s outward self is not the same as their inner self. The novel’s duality is also reflected by its setting, Brighton, where, hidden behind the veneer of happy holidaymakers, a thrilling war wages between two rival gangs. Brighton Rock’s plot follows Charles Hale, a reporter, who has been used by Brighton gang lord Colleoni as an informer. Hale knows information about the death of Kite, another gang leader, and because of this he is murdered by Pinkie, Kite’s successor. The post-mortem concludes that Hale died of natural causes. Despite this, singer Ida Arnold who befriended Hale on the last day of his life is not satisfied by the scientists’ verdict. She resolves to get to the bottom of the mystery surrounding Hale’s death, and bring his murderer to justice. Meanwhile, a young waitress, Rose, stumbles across a flaw in Pinkie’s alibi, caused by gang member Spicer, and this has the potential to be dangerous for the gang. Pinkie then befriends Rose to ensure that she stays silent, which is not difficult, as Rose is very fond of Pinkie. In addition to its thrilling plot, this novel is an essential read because of the way it has been written. The use of pathetic fallacy, for example, dramatises events, such as in chapter one: as Pinkie grows angrier, the thunder and lightning become more intense. This could foreshadow rage in his future, as he may become as destructive as a storm. Moreover, the imagery used throughout is vivid, such as the war imagery used to convey Ida’s plans after she learns of Hale’s death: “The heavy traffic of her battlefield, laying her plans, marshalling her cannon fodder.” This shows that Ida is taking the investigation seriously, and is planning the best way to prove Hale was murdered. She prepared to battle with evil to achieve justice. Another key feature of Brighton Rock is the comment it makes about human nature. This is revealed through its anti-hero, Pinkie Brown – an amoral young man who is portrayed as a sinister, almost satanic character. In chapter one, for example, the reader learns that his phone number ends in triple six, an indication of his hellish qualities. Despite his nature, however, Pinkie does merit a degree of sympathy because of his impoverished upbringing, and the fact that his hardened exterior is not all it appears to be (like Brighton rock) – he joined the gang in an attempt to better himself, not out of a love of crime. My sympathy for him was at its greatest in chapter one of part four when he attempts to repent for his sins; Pinkie believes that, “you could be saved between the stirrup and the ground,” but only if you repent.